I'm a Persona fans, a huge fan of it! But, I have to say one word for P4 The Golden, "DISAPPOINTING!!!" The art in P4Golden is a bit brighter and simple than the original story (talk about junk), the songs are quite matching with the series. And now for the character section, our protagonist Yu Narukami clearly have different personalities than the original story. Yu in Golden is more charismatic and courageous person. The problem is the rest of the party, they just waiting for turns to talk, just like cycles. What began as a triumphant success, both critically and commercially, in the gaming culture at large, even outside of the JRPG community, has now devolved into whoring itself out, Type-Moon style. That is not in of itself a negative connotation, as the spin-off games and the Vita port are great in their own right. However, the event that started the whole milking process started with the announcement of an entire adaptation of Persona 4 in anime form back in 2011. It would be of no surprise to anyone that it was a thing that, in the end, would be looked at as a project that could not be called anything but unnecessary. Speaking as someone whose favorite game is Persona 4 and will cherish it til the day I die, I’ve also adored its Vita port Persona 4 Golden. With its different mechanics and new awesome scenes, it also brought a new character, which breathed all new life to it. Now, after much popular demand by absolutely no one, Aniplex thought to themselves, “Remember that Persona 4 anime we made a couple of years ago? 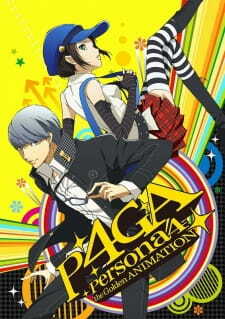 Why don’t we make another one for the port to cash in on the hype for Persona?” Atlus probably had a hand in the decision too, but nevertheless, Persona 4 the Golden Animation is nothing more than just decent fan service for fans to see; even with the inevitable cringe-worthy attempts at trying to adapt it fully. For those who aren’t aware of the concept of Persona 4 Golden, it is basically another version of the original game with a different side character that we get to know over the course of her own story. What the anime wants to do is solely focus on the new character, named Marie, and find out the mystery of who she is and why she is there to begin with. Suffice to say, this does not really bode well in how they handle the pacing and development. At one point, there are several parts where they skip over important development in order to fit 13 episodes in with Marie’s development and animate the extra scenes; this includes the beach fanservice, the band practice, motorcycle licenses, etc. Ironically, this problem of fitting too much content into one season was the same exact problem with the 1st season. They wanted to fit as much content as possible to make it feel like an authentic Persona game in full anime spectacle. While it is admirable of them to at least try to accomplish this, it fails quite considerably. There are many instances where the pacing felt too quick for us to understand and feel for our characters. If they were to make this into a bonafide hit, a longer episode count would’ve sufficed a bit more for one. But in this day and age where shows longer than 24 episodes all come and go, I don’t think Aniplex has that kind of budget to have had that accomplished. Art and animation has its moments of eerie distinctiveness, where the characters are drawn quite on point to how Atlus usually draws their Shin Megami Tensei characters. However, there are moments where the art quickly goes down south at a draw distance where the characters look very deformed. Not to mention the animation can be guilty of this too with stiff motions at certain frames and cutting corners here and there. When the battle scenes do occur, the art and animation is pretty stellar to see, so you can obviously tell where Aniplex put most of their budget towards. Despite this not being a great adaptation, should this be outright slandered by Persona fans? Not entirely. What is still intact from the source is the humor, which can still serve to be a delight on multiple occasions. Seeing them in animated form definitely helps make it more memorable in this light. Not only that, but there are a few interesting bonuses they added to the story, in spite of its flawed presentation. Adachi’s past is given a lot of in-depth analysis, which has him seen in a more sympathetic light in how he became a police officer and so on. I’m sure many will ask the obvious question: Should I play the games or just watch the anime? Or, should I watch/play Persona 3 first before 4? Depending on your preference, the games will prove to be more fruitful in experiencing a truly brilliant story to behold. Golden only proves to have more of the same systematic problems from the previous iteration. Even without mentioning it in regards to how it compares to the game, it isn’t really anything that noticeably special. Fanservice shows are of no small quantity these days, so your best bet is to leave the fanservice for the fanatics to dive into. Persona 4 Golden seems a bit intimidating to watch at first. Based off of a highly popular game for Playstation Vita, there may be high expectations when it comes to adaptation. And why shouldn’t there be? The franchise is already popular and the concept of Persona itself should be enough to hit a few chords. The only catch is that Persona 4 Golden isn’t necessarily a sequel or spinoff. Instead, it’s a remake of the original series with the addition of a new character. Rebounding back with the story of the original series, Persona 4 Golden is far from a golden egg. Even when coming into the show as an anime only viewer, it’s easy to say that the foundation of the show is built on knowledge of the Persona world. In other words, the producers assumes you’ve at least know some aspects of the show. If you’re coming into the series completely point blank fresh, then confusion might be a factor to endure. The first episode begins with doses of mysterious concepts as we meet protagonist Yu. He comes into contact with a strange avatar dubbed as the Persona and fights even more mysterious monsters. However, what’s really strange to me is the way the first half of the adaptation that came following the pilot episode. There’s little to no explanation regarding the events of what has happened. Instead, the show transits into slice-of-life formulation with the introduction of a variety of characters. The most prominent of them is Marie, the new girl in town that we meet in this remake. And to be honest, I’m not that impressed. For a show that has both a smart and intriguing premise, the first half of the series leaves me with a bit of disappointment. It feels bleak and the slice of life aspect builds on repetitive teenage-esque drama rather than supernatural phenomena. When you hear of the word “persona”, what you may think would be something along the line of “just what is that”? Sadly, patience would have to play a key role if you want to find out. The questionable decision to adapt the show this way leaves me wondering what the slice of life purpose really is. Furthermore, some of these questionable episodes feels rushed and leaves moments that are easily forgettable. These may include beach episodes, shopping sessions, and even forming a band. It takes roughly half the series to once again focus on the concept of Persona again. That’s just a whimsy shift and inadequate decision. As being foretold as an alternate continuation, the series still takes place in the town of Inaba. A major difference is the introduction of Marie, whom Yu befriends early on in the show. The two aren’t very compatible when it comes to their personalities. Their strange relationship can’t be depicted as romantic either since Yu doesn’t seem to show feelings for her or vice versa. To say the least, I could describe them as more of acquaintances. Portions of the story focus that is expanded in this adaptation seems to be focused Marie. As we find out, she has a case of amnesia so this show begins to unravel more secrets about her character. In essence, it creates a modern-life journey for her to recover those memories. Her relationship with other characters is mostly minor except for Yu whom she interacts with the most. As such, we only see most of her true colors during their times together. But for such a key character in this series, there’s not much appeals with Marie. She is reserved but not always shy to speak out her thoughts. Her lack of common sense on occasions is played out as a joke along with her tsundere-like tendencies. The plus side is that she isn’t a girl that causes trouble but just doesn’t seem to be able to catch a viewer’s interest despite the focus on her character. Speaking of characters, most of the original cast returns in this show ranging from cheerful Rise, the elegant Yukiko Amagi, tomboy Chie Satonaka, or clumsy Yosuke. Even Kuma makes his return that reminds us the show still appeals to peculiarity. Despite their lack of characterization, all of them get some moments to shine and a chance to interact with Yuu and Marie. The drawback is that there’s less prestige focused on their roles in the story. The plus side is their diverse personalities that leads to certain events that can be entertaining. But even taking this for granted, their performance is underwhelming filled with lackluster and stereotypical clichés that makes it all look bad on paper. If you lasted over half the show, then the patience might pay you off. Despite the overwhelmingly saturated amounts of clichés in the first half, the latter part of the show becomes more plot oriented. Characters such as Adachi and Teddie get more highlight with their roles. The former stands out as a testament of suspicious deeds after it’s clear that Adachi is more than who he claims to be. The climax of his battle against Yu serves as a solid example of Persona should be. The endgame is that the show had weak buildup leading to such a powerful climax. Thus it created less anticipation but more so on resolution. On the other hand, Marie’s side of the story also becomes centralized regarding her amnesia. Although relatively short, it’s clear that there is a bonding relationship between Marie and Yu that is emphasized in the final few episodes. Challenging himself to his limits, Yu struggles to bring back memories of Marie and the girl he once knew. It also creates moments of revelations as we find out more about Marie’s identity, her role, and ultimately what she wants to do. Perhaps the two most noteworthy moments of this subplot are Yu’s search for Marie (especially in a snowstorm) and their reunion. Although relatively short, it captured a profound image of their relationship. On the other hand, other characters are seemingly left out in the dark with minimal roles while I have to wonder why they get involved in the first place. Ultimately, it creates the result of a rushed adaptation. Creativity deserves some attention for Persona Golden namely with the action. Although CGI can be a bit distracting, it does pay off with the way it’s utilized. I give some credit for the way Personas are designed and the fluid action they are involved in particular with episode 11. Then, there’s the humor that is a mixed bag. While most of it feels forced or cheesy, there are some charming moments when the show delivers what it’s trying to do. And while the jokes are stale, the character interactions are genuine that defines what friendship is all about. However, the mechanics of the game remains stale. You’d expect some exposition but in the end, you’ll be left out stranded if you have no knowledge of the Persona world if you don’t pay attention. A-1 Pictures pulls their strings and as the company involved with the anime production, I could only say that the visuals are moderately adapted. Taking a good look at the characters, their models look weird and unrealistic. The only decent character design I can take my hat off to would be Marie for her unorthodox way of dressing up. Backgrounds are also fairly blend except for the battlefields in the otherworldly arenas. It’s there that creativity deserves some props. But if you want to talk about praise, then most of it should be focused on the Personas. Indeed, they are designed with great peculiarity but also distinctive marks of intelligence. It’s hard to recall exactly a word to describe them but the Personas stole the show when it comes to visual dynamics. When combined with effective camera angles, Persona 4 Golden actually shines more than meets the eye only for that element. Soundtrack has some influence but isn’t exactly a powerhouse. The OP song may be different (except for one episode that used the second opening song from the original season) but it still maintains the same tone. Its repetitiveness has no bounds either when it comes to its quirky OST. On the plus side, action scenes again takes control with its choreography; a sharp contrast to its easily forgettable SOL background music. For the character casting, most of them retains the same way of their mannerisms. I think I already mentioned Marie before but her tsundere-like voice can be borderline annoying and childish. However, Yu seems to have matured a bit with his much more confident voice as result of his max stats retained from the original show. So, what’s the best way to enjoy Persona 4 Golden? I’d probably say patience. If you’re bored by the end of the first episode, then take heed and drop this show. The first half has that slice of life feeling where each episode almost seems like a different show. But once you get through that, it might pay off with the focus on Marie and the main story. Rewards worth reaping would be the action oriented scenes with solid coordination and tolerable soundtrack. And while the comedy in most aspects is dull, there are occasional moments where you’ll find yourself burst out laughing. Ultimately, Persona 4 Golden is short of achieving stardom when it comes to its end product. Rather, it’s more like one of those shows that tries to work on its own terms but didn’t achieve its end game. Watch Episodes 6 & 7, Persona fans! As for the rest, well, my (first) review. The Golden Animation, simply put, is all the scenes from the updated rerelease from the game, animated and stretched out a bit. As opposed to the strange combination of social life, school days, and vigilante-Shadow-fighting-crime-solving that was Persona 4, Golden, when taken at face value, comes off as a typical Slice-of-Life with a mystery sub-plot that isn't even explained well. Which is admittedly understandable, though it doesn't improve the series. Our returning characters have their previously established relationships hinted at, as with their slightly more complex personalities, but they're mostly shoved to the side to make room for the amateur poet amnesiac with enough tsundere to give Ms Rin Tohsaka a run for money, Marie(a.k.a. canon love-interest). The series has no direct focus, but Marie's story in context of this expansion, translating to giving the girl some memories that might jog her old ones. As a fan of Persona 4, I can admit that I found it enjoyable to watch, though that might have been somewhat mitigated by the conscious knowledge that I was supporting the ludicrous overmilking of Persona 4 that still continues with its yet to be released PS3 port and Rhythm Game spinoff. Even if the new artstyle took a moment to get used to, they were the guys who did the cutscenes for the game and they weren't too shabby here, either. Props, Madhouse. I say watch the aforementioned episodes because they have direct relevance to the original Mystery/Reach Out For The Truth story by offering a look from the killer's eyes through the whole story; from before the murders to his inevitable defeat by the heroes. Aside from that, though, I can only recommend this to someone who has already seen or played the original story and wants the canon equivalent of a fanfiction added on. I have no malice for this series, no anger with it that motivates me to give it a low score. But it just doesn't do anything noteworthy aside from the moment in its midpoint where it briefly returns to its source material to do what one might have wished at least half of the episodes had done. Perhaps it's for the best, though. Golden did have a happy & satisfying alternate ending, though.